Many of us that live on the west side of the Cascade Mountains in the Pacific Northwest think of rhododendrons when it comes to broadleaf, evergreen shrubs. Yet many other wonderful shrubs with handsome foliage add life to the garden during our rainy winter months. 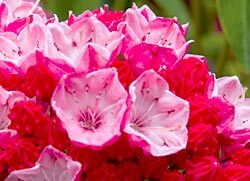 Kalmia (mountain laurel) is one of these. Its leathery leaves carry the shrub throughout the year. A North American native, the shrubs thrive in woodland conditions, rock gardens and even swamps. These shrubs range in size from six inches tall to ten feet tall, giving many choices for the Northwest gardener. 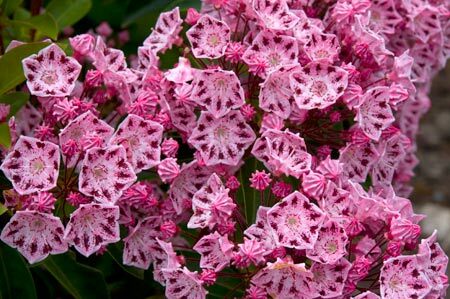 Kalmia latifolia, one of the taller species, is also referred to as Calico bush or Mountain laurel. The shrub reaches ten feet tall and ten feet wide, with a few exceptions, such as K. 'Elf' at three feet and K.'Minuet' at four feet. The lance shaped leaves provide a dense covering over the bushy shrub. In my garden, I grow K. latifolia 'Ostbo Red'. I saw it bloom for the first time in 1998. Red buds form and open to a pale pink. The effect of both colors together is stunning. After two years in one garden, I transplanted it to my new garden. I look forward to more spring flowers in the coming years as it grows next to Rhododendron 'Bluejay' and blooms in the early June garden. Both shrubs are suited for growing together since they both enjoy a shaded position and acid soil. Another cultivar, K. latifolia 'Shooting Star' has an unusual white flower deeply cut into five lobes reflexed when the buds open. It is on my list of shrubs to add to the garden. Another one is K. latifolia f. fuscata with white flowers and a purple or maroon ring just inside the edge of the blossom. Kalmia microphylla or Western laurel is a native of our region. I enjoy finding it on hikes in the mountains around the Northwest. It stands about six inches tall. I have the perfect spot for it in my native bog garden and soon hope to add a group of this small shrub. K. occidentalis, another Northwest native, grows in the lowland bogs and is an additional choice shrub for a wet spot in the garden. Kalmias thrive in moist, acidic, humus-rich soils. K. latifolia grows best in open to deep shade, although darker shade will sacrifice flowers. However, have observed the smaller northwest natives I growing in full sun and boggy conditions in their native habitats. I give mine a mulch of shredded bark and keep it well watered. Pinch off the flower buds when they fade to increase the bushiness of the plant. Prune the shrub after it is finished flowering and only when necessary to shape the plant or to keep it small. Prune lightly, as hard pruning may keep the shrubs from flowering for a few years. In the Pacific Northwest, Kalmias grow exceptionally well. Find a place in the garden for these shrubs and you will be rewarded with beautiful flowers and evergreen foliage throughout the year.